Here’s Your Sign is a sign making workshop that comes to you! We offer an array of on-trend designs to suit any home or style. Sign making parties are perfect for birthday parties, bachelorette parties, mom’s night, business gatherings and much more. Bring your creativity and a willingness to learn and you will build a wooden sign piece from scratch that is worthy of your walls. Interested in hosting a workshop? I would love to come to your home or business and help your guests create a sign they’re proud to take home and display. 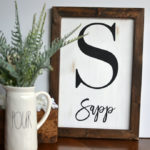 Find out all the details of hosting a Here’s Your Sign workshop. Are you hosting or invited to a Here’s Your Sign Workshop? The next step is to pick your sign design. Pick from over 50 designs in all shapes, sizes and themes. Don’t see anything you like? Contact us so we can find a design you will be proud to display in your home.